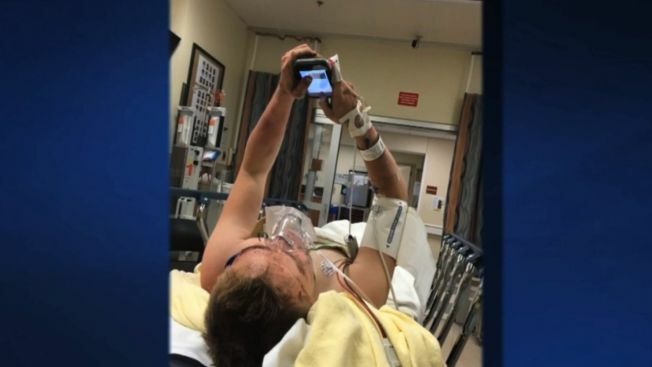 "I guess I'm stuck with an iPhone for the rest of my life"
A Tennessee teen is alive today thanks to Siri, he says. Ray told media outlets that a jack collapsed, pinning him under nearly 5,000 pounds of metal in a location where he couldn't be easily seen or heard. He says he was trying to get free when he heard Siri activate. "The map got to his street. ... It got pretty close," Lee said. "But he was yelling his address, and that was the best thing he could have done." "I could feel myself slipping," he said. "I was starting to accept that I wouldn't get out." Rick Miller, who is chief of trauma and surgical care at Vanderbilt University Medical Center, said Ray suffered broken ribs, a bruised kidney, cuts and a concussion, and he had burns on one arm. Miller said Ray is lucky his wounds weren't worse. "Sometimes these crush injuries can be devastating and can kill you," Miller said. "I've never heard of a story where you can figure out a way to use Siri to call 911 and get yourself rescued." "I guess I'm stuck with an iPhone for the rest of my life," he said. "I owe them that."